THIS PAGE LISTS PLC SPARE PARTS FOR SALE. Are you planning to upgrade your S5 PLC installation ? Design Technologies has many years experience in S5 and S7 installations. Are you urgently looking for Siemens S5 PLC spares ? Do you wish to sell your excess spares or used S5 parts ? 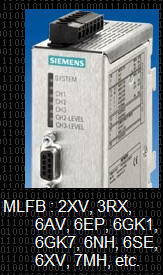 Design Technologies offers a network of users of Siemens PLCs the ability to source and trade their Siemens S5 parts. With the new improved range of S7 PLCs available for many years already, the phasing out of the old S5 range has become inevitable. Call us to help determine your optimum upgrade path. - How long will I be able to find spares for my S5 PLCs ? - When will I need to upgrade from S5 to S7 ? - What will I do with my S5 spares, held in storage for all these years ? - If I upgrade, is there a market for my used S5 parts ? These are but a few of the questions that many of our clients are asking. We have found the question around spares availability (short and long term) and ultimately the ability to get some return on redundant S5 parts to be the foremost. See our frequently asked questions section below for some answers. For clients wishing access to spares, and others wishing to sell surplus, or redundant spares, and even used S5 spares, please contact us for more information. Below are some of the questions that we have been able to answer to our clients. Some links are also provided to provide relevant information. Q - How long will I be able to find spares for my S5 PLCs ? A - All of the available S5 range of spares have already entered the 10 year window, after which no spares will be manufactured, only repairs to existing cards. Go to the official Siemens website. There are many more links to S5 conversions, upgrades, etc. We have a .pdf file (size : 588kb), which contains an extract form an October 2002 Press Release in Germany. Click here to view or download this file. Q - There are so many users of S5 PLCs, each with his own spares. Won't those spares last us all a long time ? A - It may be a false sense of security that "there are so many spares out there, it will last a long time". Many spares - yes, but also many users. Q - Should I be buying a lot of spares now, to ensure a longer life of my S5 installation ? A - Each installation should be treated with its own merit. If you are planning to upgrade soon (next year or two), we would not advise a hoard of S5 spares. If you intend to keep your S5 installation going for another 15 years, you may have difficulty in finding spares at that time, and may need to invest in some spares in the near future, or join our spares network by sharing available spares with other S5 users. Q - When will I need to upgrade from S5 to S7 ? A - We do not advise any new installations to be built with S5 PLCs anymore. We have already seen the price of S5 equipment go higher than its equivalent S7 part. There are many reasons for this, but we believe, the longer you wait, the more it will cost you to maintain your S5 equipment. Ultimately a part that is no longer available may impact on your production. Start planning your conversions already ! Q - I have an S5 PLC with some additional I/O. What is the optimum upgrade path ? A - Smaller (S5-95U or -100U range, and some -115U range) installations may require a complete replacement of all hardware simultaneously. However, the upgrade is planned to have minimal effect on production during change-over. Q - I have an S5-155U with a lot of remote I/O, with an old DOS based SCADA. Do I need to change it all at once ? 1. Upgrade your SCADA to WinCC. You will have to do that sooner than later. The support on old (DOS based) SCADA packages is becoming very thinly spread. 2. Upgrade your remote I/O to to ET200 (S7 hardware) which communicates happily to the larger S5 ranges. (115U and 155U) Minimal software changes are required for this step. Q - What is the least costly route of upgrading an S5 PLC, with sub-rack I/O, and SCADA. A - The least costly will be to do an immediate all-inclusive upgrade. However, since this carries a high risk of a serious interruption to production, we do not recommend this. If you really have budget constraints, you should convert your Main rack and SCADA simultaneously, to prevent a later requirement for re-engineering. Q - What will I do with my S5 spares, held in storage for all these years ? A - Hold onto those spares, as long as you may have a need for them. If you are planning on upgrading, soon, or have already converted all S5 installations to S7, you may want to list these spares for sale, so as to allow other users access to them. Q - If I upgrade, is there a market for my used S5 parts ? A - With the installed base of S5 PLCs, many users will stretch the usage on their equipment as far as they can. By making your used parts available for sale, you give others the opportunity to lengthen the life of their investment, and you get a return on equipment which you may otherwise have written off as a loss. If you do an upgrade project with us, we will make you an offer for your used S5 parts. For further enquiries, or to place an order for any part listed here, please contact us by phone or email. Further contact details here. Deliveries will be dispatched within 24 hours from receipt of payment. Subject to prior sale of stock. Errors and omissions excluded. The spares list gets updated regularly, but a listing here does not guarantee that the item is still available. Please contact us before confirmation of order.